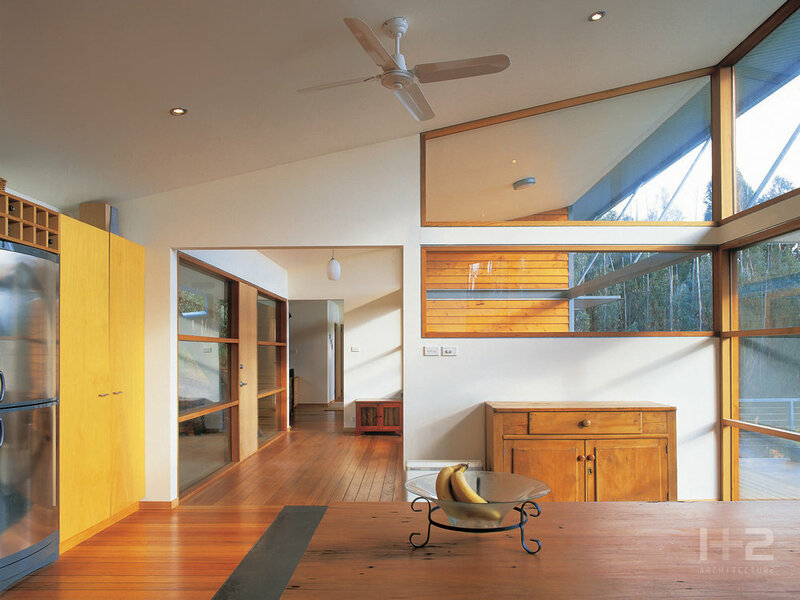 This house for a young family is sited on the fringe of dense native woodland, overlooking pasture, towards distant mountain and river views. The house is autonomous and through design, endeavours to invoke a sense of sustainable lifestyle and belonging with its environment. This award is considered a “best of the best” and is awarded to the outstanding design of the previous three years." "The Jury is impressed with all aspects of this autonomous house which has no connection to town power water or sewer. The layout is simple and environmentally efficient. The building form is essentially familiar, though the entry bridge with its steeply raking roof, which sets the solar panel at its optimum pitch, is far from predictable. This house abounds with examples of beautifully realised solutions to both usual and unique design problems. The jury believes that Andrew and Jen's house exemplifies a commitment by the architect to meeting the client's exacting brief by designing a building which is able to exceed their expectations through its architectural refinement and integrity."